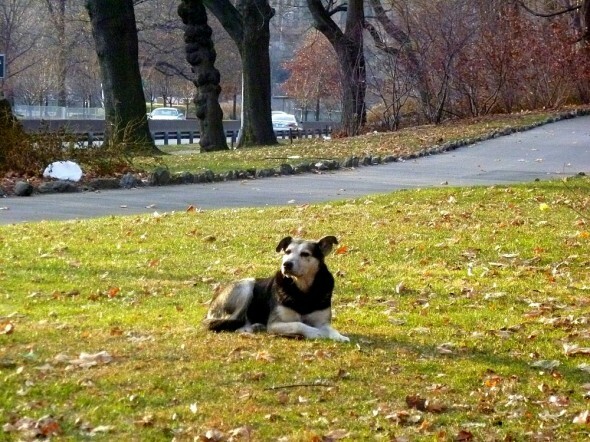 An upper Manhattan woman slept outside in a makeshift shelter for two days straight — braving ruthless winds and bone-chilling temperatures — as she risked her life to save a stray dog from freezing to death. 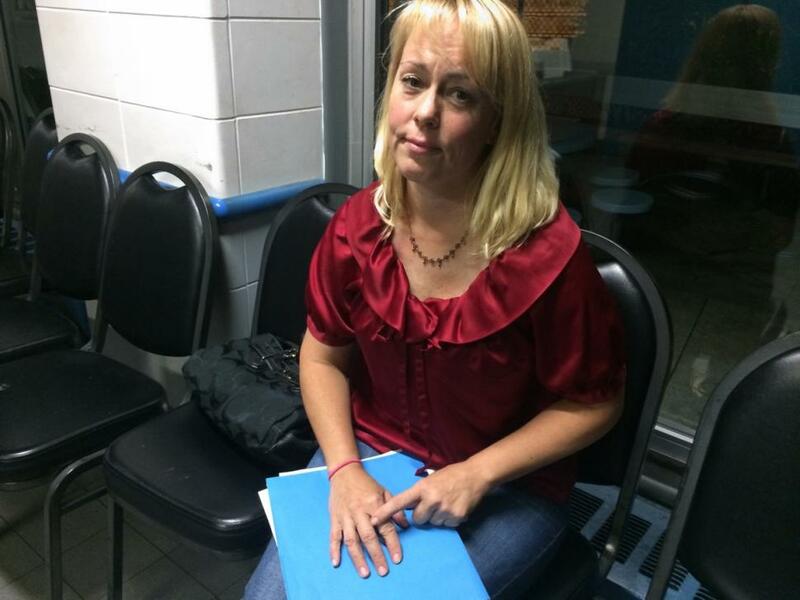 Denise Lauffer, 40, is a dog walker who has adopted three feral dogs and a stray since she moved to the Washington Heights area in 1994. 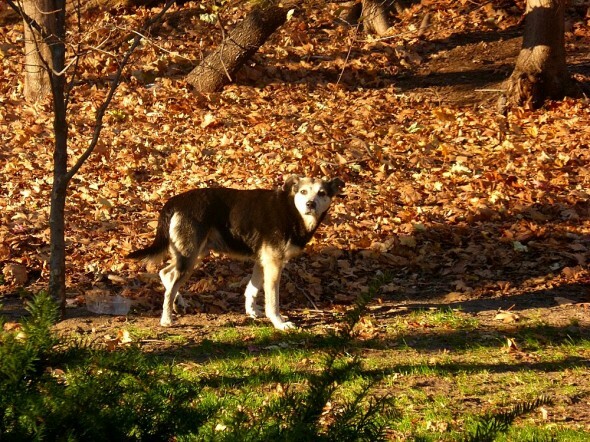 For the last several years, she’s been leaving food out for Charlie, a dog born within a pack of wild dogs that freely roamed Highbridge Park. 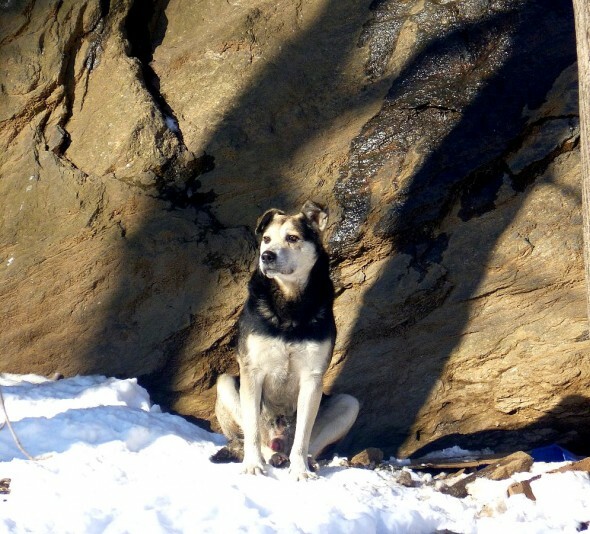 All of the other dogs were captured about five years ago, but Charlie has managed to elude all efforts to catch him. 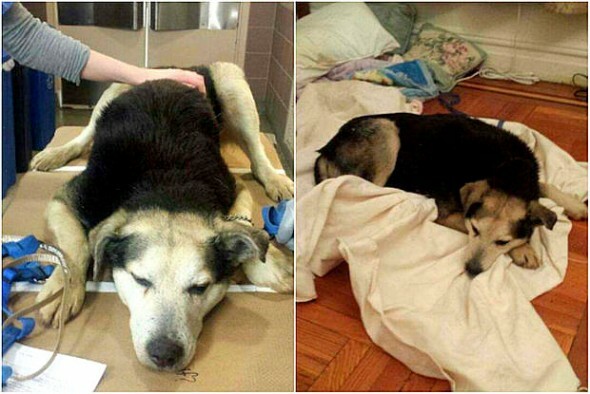 Now at 10, he’s slowing down, and with temperatures below zero this week, many feared that he wouldn’t survive. 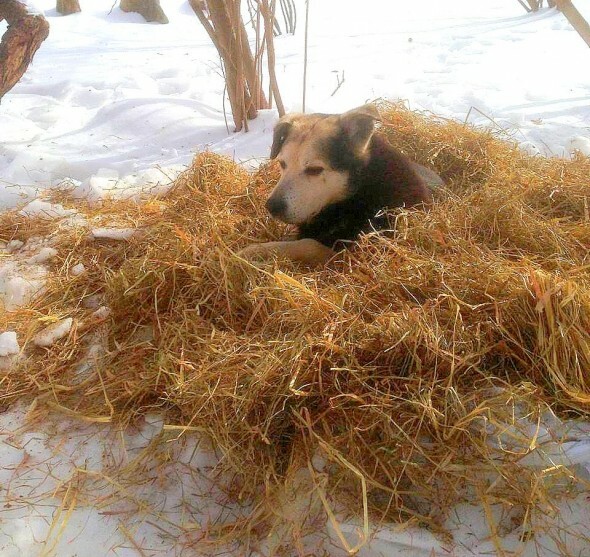 “He no longer has his pack, he’s a slow old man now, and was not going to make it in this extreme cold,” says one of his fundraiser pages, noting that the wind chill made it feel like 22 degrees below 0. Neighbors at the other end of the park had also been caring for him and called him Ricky. They brought shelters, food, blankets, and hay, which would be removed periodically by park security. A Con Ed worker even brought him 30 hand warmers. “We just all happened to bump into each other; we started exchanging phone numbers,” said Tina Ilmet. 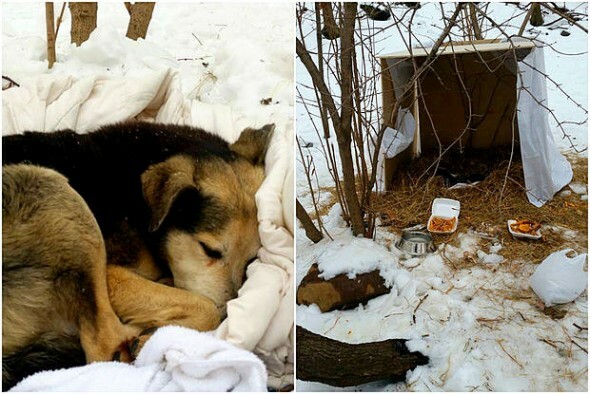 Last week, Lauffer began sleeping in a makeshift shelter she made for Charlie in the woods to try to gain his trust enough to get close to him. During her two-night stay, Lauffer fed Charlie hot meals, and he let her snuggle up with him at night. “I was able to line the bottom of his bed with hand warmers,” she said. Finally on Sunday, a group of neighbors managed to lasso him and corral him into a van and get him to Animal Medical Center. He was treated, and one source says he was released into the care of Ilmet, however, another source says that he is staying with Avezbakiyeva. But she noticed he wasn’t eating or moving around much, and brought him to Blue Pearl Animal Hospital in Hell’s Kitchen for testing. It is likely his symptoms are age-related, but he may have Lyme disease. Another fundraiser page was created by Faye Wang, who has been in contact with the “Ricky” group of helpers and keeping fans up to date on the dog’s progress. Over $10,000 has been donated toward his medical care, much of which came in through Lauffer’s site, so Wang has decided to close her fundraiser. Charlie will likely be discharged within the next couple of days. 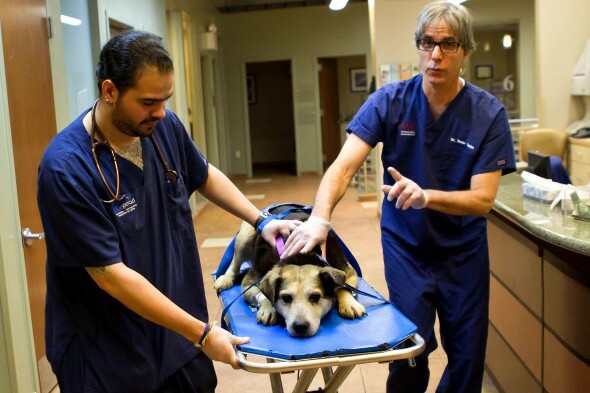 His fate hasn’t yet been made public, but it is hoped that he will go home with one of the many people who have been caring for him all these years. When I think of the sacrifice that woman made for the sake of a stray dog, it makes me feel a little insignificant. God bless people like her. I saw this on the local morning news, she is a saint and I am so glad that sweet boy is safe and warm now. Wonderful. We all deserve a second chance. I’m glad the sweet boy is getting one. Why didn’t she just take him home. If it had of been a person she would have ignored them.